Tonight, I’m making one pan balsamic chicken and veggies, compliments of Cookingclassy.com by way of Pinterest. I’m ALL about anything with the words “one pan” in the title….even though I ended up using 2 (spoiler alert!) plus, I looooooove me some balsamic vinegar, so I was super excited to try this dish! I buy all of my chicken breasts at a local whole-foods type place, because about once a month they run a crazy sale and you can buy value packs of chicken breasts for like, $1.77/lb (heck yeah!). I had stocked up last week so they were all in the freezer, but fortunately I had had the presence of mind to pull two breasts out last night and put them in the fridge. Thank you, yesterday Katie! Season chicken with salt and pepper to taste, then place chicken evenly in skillet. Cook about 6 ­ 7 minutes, rotating once halfway through cooking, until chicken has cooked through. Wait. These are still frozen solid, ice crystals and all. What? The first thing that you should know about me here is that things like this are -very- commonplace in my kitchen. Now granted, there are some problems with my cooking that are 100% my fault, and I’m well aware of that, but the chicken not thawing isn’t one of those things. Chicken in the fridge should thaw. Enter the Pinehurst Curse. While the chicken is speed-thawing (By the way, turns out it was some dude named Percy Spencer. Thank you, Percy, for the microwave), I go ahead and make the sauce for the chicken. In a mixing bowl whisk together salad dressing, balsamic vinegar, honey and red pepper flakes, set aside. Combine and mix. Easy. I’m not sure why the italian dressing it coming out so clumpy….is that normal? I add a little water just in case, and the consistency looks right. Next comes balsamic, yummmm, such a wonderful scent! Then honey. 1.5 tablespoons. Turns out I’m practically out of honey, so I just add whatever I can get out of the bottle. It’s a little more than one tablespoon. 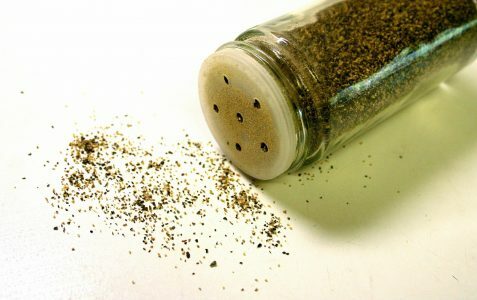 1/8 teaspoon Red pepper flakes. Wait, 1/8 teaspoon? What the heck kind of measurement is that? Whatever. Shake shake shake. Done! By now, the chicken is pretty much not frozen anymore. Close enough. I heat olive oil in the pan, slice the chicken into appropriate sized pieces and toss the it into the pan. The lack of sizzling when I drop the chicken into the pan makes my heart sink, because I know that when the chicken doesn’t sizzle, the pan isn’t hot enough, and the chicken will end up being dry. (Why do I know this? Because this one time, it sizzled, and the chicken was perfect. Yep, one time.) I also realize that even though I used a little less than the recommended one-and-one-fourth pound of chicken, there’s entirely too much chicken in the pan. I make a joke to my husband across the kitchen about having medium-rare chicken for dinner, and he’s not amused. As I’m peeling tiny shreds of carrots with my very small, flat cheese grater, I’m realizing I should probably buy an actual 4-sided cheese grater. Do they make collapsible ones? They totally should, because there is no good way to store those things. I also need to get a cheese slicer. And new beaters for my electric mixer. As the carrot gets thin and starts to bend, I think of a this joke I read earlier today about a Jedi, and……no. Stop. Maybe this is why I can’t cook. Once the first pan of chicken is no longer pink, albeit a bit sad looking and rather dry, I set it aside and add the veggies to the pan. The recipe says to cook for about the green beans 4 minutes, or until tender. Four minutes later, the green beans are still completely crunchy. This is an occurrence nearly every time I cook a meal. Shouldn’t food + heat = cooked food? Not for this girl. Even now, I don’t order pizza. Go me! In another 8 minutes or so, the extraneous chicken is looking good, the green beans are, well, edible, and the carrot shreds have withered away to practically nothing. Curse you, non carrot straws!! Add remaining dressing mixture to skillet and cook. Wait, wait, remaining dressing? What does that mean? Ha! Apparently I did a terrible job of reading the recipe and I was supposed to put half of the dressing in while the chicken was cooking. Better late than never. I add the sauce to the pan. Oh, goodness, that balsamic smells SO good….rich and tangy and…Smokey? After removing the pan from the heat a minute, tossing and stirring like a mad woman, and not ordering a pizza, the crisis is averted. Now for the magic moment- I go to dump all of the chicken and veggies back into the same pan (So much for one pan) and start to toss it around in the sauce, except there won’t be any tossing here, because it all -barely- fits in the pan. Did I make too much? Was I actually supposed to measure out exactly one-and-one-fourth pounds of chicken, and one-half-cup slices of grape tomatoes? Do the pros not just eyeball everything? Or perhaps, was I supposed to make this in a wok? But then wouldn’t they have had the decency to call it One Wok Balsamic Chicken and Veggies????? Forget tossing it. I proceed to stir it in very, very small circles. But man, it smells good. Remove chicken from freezer to thaw two days ahead of time. Or maybe three days. Throw in twice as many grape tomatoes, because those babies are pure magic after they melt into that balsamic sauce. Read the whole recipe, slowly and thoroughly. Delete the Papa Johns app. If the chicken is still in the package or a Ziploc bag, an hour or so in a bowl of water big enough to submerge the chicken under a slowly dripping faucet in the sink will thaw that much chicken. 😀 We have to do it all the time when we forget to pull something out early enough. This is so funny and relatable for all new cooks!